Today is our final day of exploring, and we're returning to Goblin Valley State Park, which is where one large section of Galaxy Quest was filmed. 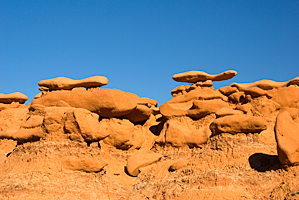 Goblin is an area of sandstone sculptures that have been eroded from the shallow sea mud that once covered this area. We tried to time our trip for the end of the day, but unfortunately the light was hazy and the sky was flat even at sunset. It was still fun wandering around through the goblins and hoodoos. We found ducks, balancing rocks, Chinese pagodas, pirates, and dogs. There were only a few people in the entire valley, so it felt like we had it to ourselves.